Careful With That Axe, Eugene: Dad - 77 years young today! Happy birthday to my Dad Joe on his 77th birthday today. Dad was born on 31st March, 1931. I called to wish him Happy Birthday and even sang "happy birthday to you" to him which he enjoyed. He is in great form and is keeping busy with growing plants and amateur drama festivals. The photo to the left was taken just after Dad's 75th birthday in 2006. 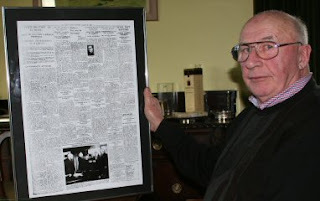 The framed newspaper page is from The Irish Times on the day of his birth. Long life and happiness to Dad!